One of my favorite parts of traveling through Bali, is of course the culture. The level of devotion you see and feel is truly a gift to witness. Rituals are an important part of everyday life here, and I think the strong sense of spirituality magnetizes many people to this island paradise. On our last full moon in Bali, we drove through the rice paddies from Ubud all the way to the beaches of Canggu. Purnama, or full moon in Bali is a special day where hundreds of temples all over the island celebrate by hosting beautiful ceremonies and festivities. The Balinese believe that Purnama is a day when Gods descend to this Earth and give their blessings unto us. On this sacred day, hundreds of ceremonies are held in all corners of the island to honor the Gods with offerings such as food, fruit and flowers. The Balinese are then blessed by performing various rituals using holy water, incense smoke, petals and rice grains. Located on a road full of modern establishments in Canggu, Tugu Hotel Bali upholds tradition and brings you back in time sharing the romantic stories and legends of ancient kingdoms of Indonesia. Tugu Hotel Bali is a small, privately owned luxury art hotel inspired by Anhar Setjadibrata’s passion for Indonesian history. He is the founder of Tugu Hotels, which has locations throughout Indonesia, and is also the owner of the biggest collection of fine Indonesian art and cultural antiquities in the country, which you will find perfectly arranged throughout the hotel rooms and grounds. We were intrigued by the various historical experiences that could be infused into your stay, from lavish feasts and banquets of Kings from the 14th century Majapahit Kingdom with parades of soldiers, dancers, and offerings, to humble village dinners of Java and Bali with ladies cooking in terracotta pots, wood-fire, and eating with bare hands. The Tugu Spa is inspired by centuries old Indonesian spa treatments and traditions. Since we were visiting on a very special full moon eclipse in Aquarius, we booked the couples Purnama massage, and we were really excited to get some much needed R&R before our journey to the Philippines. When we arrived for our spa day, we took a little tour of the hotel, including the amazing museum filled with different items spanning through centuries of Indonesian history. We were truly in awe, walking though the room filled with antiques from the 14th century. We love history and learning about different cultures, so this was a huge treat for us. After our tour, we headed towards the spa and walked through the lush grounds. Even though we were right in the heart of Canggu, it felt like we had escaped it all and stepped into a peaceful garden off the beaten path. Our massage villa was huge, with a large outdoor bathtub and veranda. Before beginning our massage, our lovely therapists washed our feet with blessed water from the Batu Bolong Temple. I love to visit spas in all of the different countries we visit, and notice their own unique style of massage. For our Purnama massage, they used a frangipani infused coconut oil that reminded me of the smell of plumerias in Hawaii. The strokes of the massage started long and soft, then built momentum and turned into strong, rotating circles all over my body, mimicking the energy of the full moon. My sore muscles were rejoicing and I eventually fell asleep until I was asked to turn over for the most amazing head and face massage. After our massage, our therapists drew a bath filled with flowers for us in the beautiful outdoor tub. It is believed by the Balinese that to bathe in water infused with the fragrant petals of the frangipani flower under the light of the full moon will wash away any impurities. We were ultra relaxed and could’ve stayed in the bath for hours. We ended our Purnama spa day with a blessing ceremony with the same blessed water from Batu Bolong Temple. It was one of our favorite parts of the day, getting to experience a very important and symbolic part of the Balinese culture. 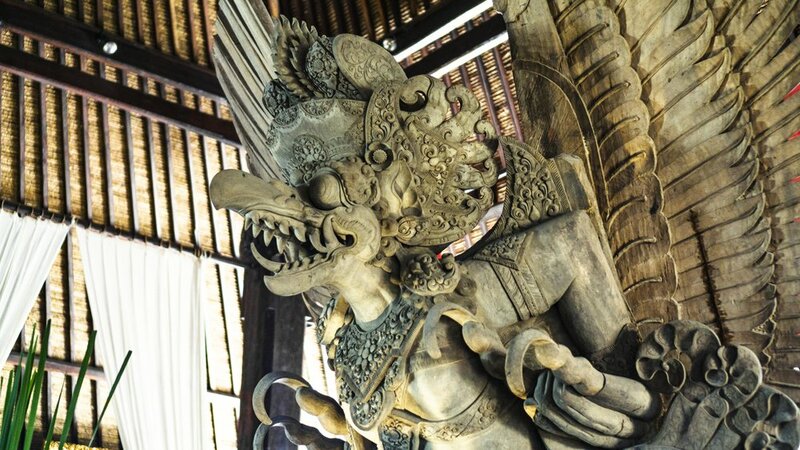 We want to thank the whole crew at the amazing Tugu Hotel Bali for such a great experience. We can’t wait to visit you all again next time we’re in Bali!